I've been looking on ebay and gumtree but they are hard to find. Thanks Quismiff. I've seen them, but they don't seem to do them in blue even though they do them in some other colours. I might follow up with them to see if they can get a blue set and how much shipping might cost. Do you know how much a pair would cost RRP? 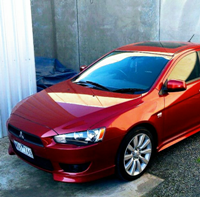 Are you able to source a pair of Lancer CJ sedan side skirts in blue? Hi no sorry we only can do what we have in stock.